GSMArena team, 05 August 2013. Nokia has a long tradition of supplying file managers on S40 handsets and the Asha 501 makes no exception. The nicely functional app has a clean interface that first lets you select between phone memory and the SD card. You can mass copy, delete and move items and folders, create new folders and sort by name, size, newest and oldest. The gallery on the Nokia Asha 501 has two tabs - the all captured tab, which holds all the images and videos you've captured with the Asha 501 and the folder view, which gives you the captured, favorites, modified and received. Images are shown in a grid of three by three that is vertically scrollable. You can pinch to zoom on images but strangely double-tap doesn't work here. You can also share photos via email or Bluetooth and edit them. Editing options include rotating, flipping, cropping, lighting and contrast adjustment and adding color effects. The edited images go into the Modified folder. You can set images as wallpapers, add them to favorites, see details and start a slideshow from the pull-up context menu. The Nokia Asha 501's music player has a neat interface and starts up with album art on top of the available sorting options: songs, artists, albums and playlists. There's no folder view and no additional settings for sound, such as an equalizer. The now playing screen shows the timeline, album art, track and artist name, along with four toggles - skip, FF, play/pause and a home icon which takes you back to the start screen. The now playing screen features a pull-up context menu from the bottom of the screen, which gives you options to fav a song, shuffle, repeat and share. The song will keep playing even if you exit the player - you get a shortcut in the Fastlane and on the lockscreen with play-pause-skip controls readily available. There is a dedicated video app that has all of your videos in a scrollable list of thumbnails. You can share, delete or view detailed information from the swipe-able menu at the bottom of the screen. The Asha 501 is capable of playing 3GP/MP4/Xvid/DivX videos up to VGA resolution, but you can experience some hiccups with the audio if the bitrate is higher than the phone can handle. The Now Playing screen offers very basic user interface with just a Play/Pause button and a scrubber. The FM radio on Nokia Asha 501 comes with a neat and simple interface. You can change stations with the dedicated controls on both sides of the centered tool for manual station tuning. At the bottom there are three controls - a star to fav a station, play from speaker and a list of your favorite stations. Just like with the music player, the FM radio will keep playing when you exit the app - you get a shortcut in the Fastlane and on the lockscreen with the station information and an off switch. With no resistance applied to its line-out (when used with an active external amplifier), the Nokia Asha 501 does decently well, achieving some good scores and garnishing them with nicely high volume levels. 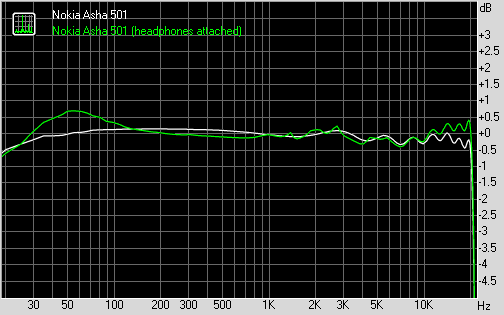 Plugging in a pair of headphones leads to a rather large spike in intermodulation distortion and a moderate one in stereo crosstalk as well as a rather big drop in volume levels. Overall, the Asha 501 does well, although it's not quite in the same league as the best in the market.